The Ravelry is doing a fun knit/crochet/spin/dye/whatever-along during the 2008 Olympics, with over 5500 members participating. 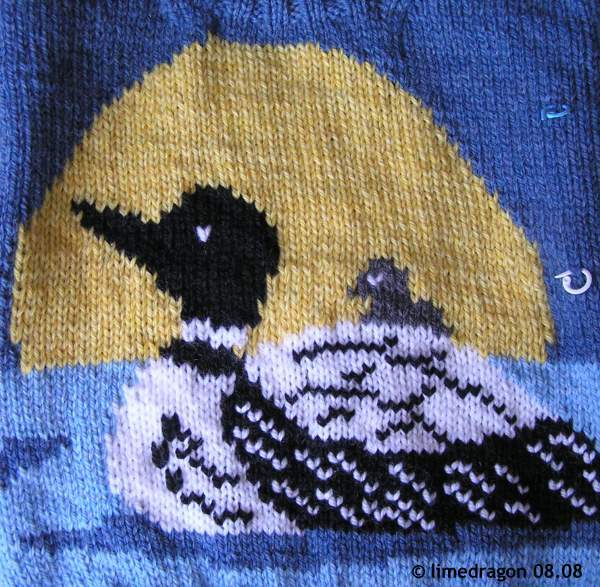 I signed up with two projects and two teams: The Loon for Team Editors and Anise Socks for Team Stashdown. 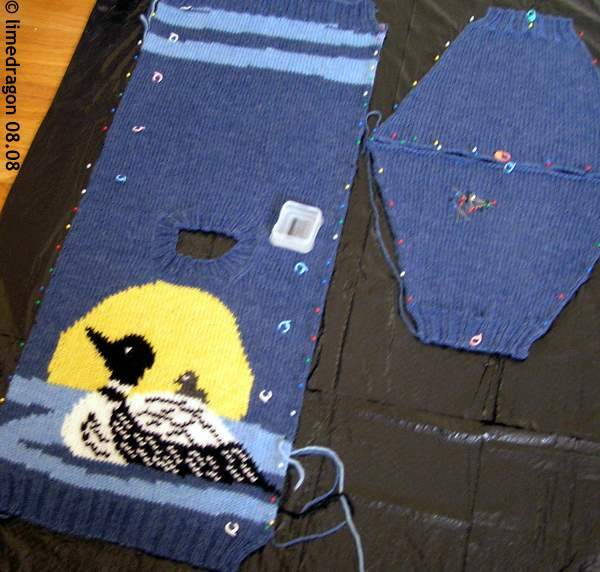 I decided to start with The Loon, to allow time for blocking, drying, and seaming. 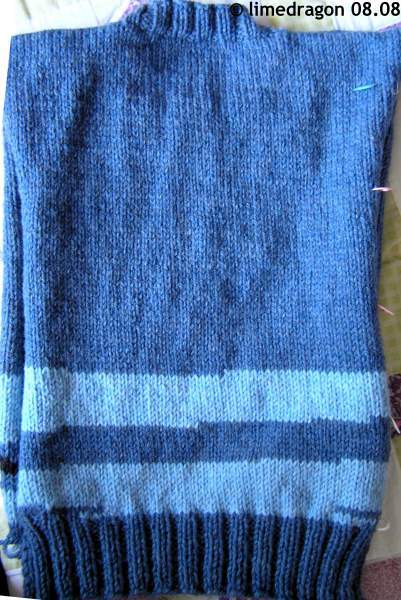 After I finished the back, I decided my 1×1 ribbed cuff was way too ugly, and I cut it off and replaced it with a 2×2 rib. 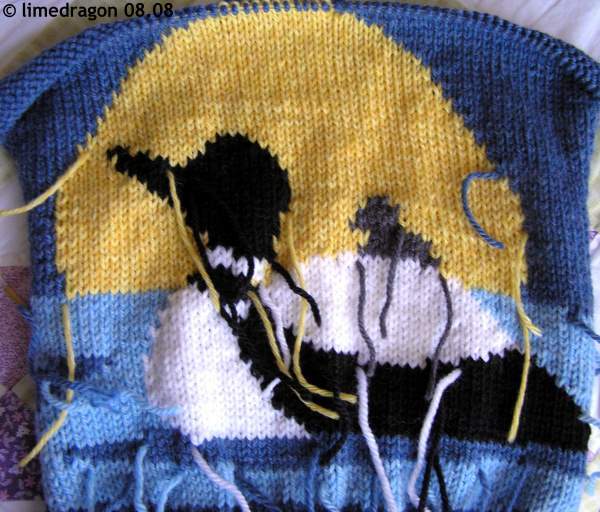 The front, with its massive intarsia insanity took a bit longer to knit, and even longer to weave in all the ends. I used duplicate stitch for the feathers. 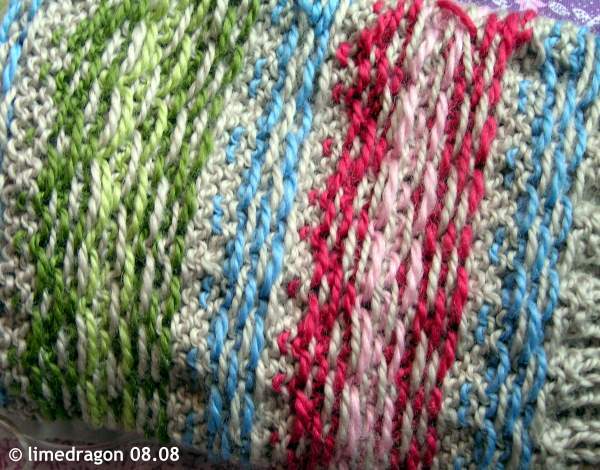 Have I ever told you all how much I dislike duplicate stitch? I really don’t like it; perhaps it’s because I used to do counted cross-stitch and my duplicate stitch doesn’t look as neat. Nevertheless, I’m very happy with the results, and the added texture from the duplicate stitching is a nice bonus. It was all worth it! Yesterday I was able to soak and then block the pieces. There’s just the seaming left to do, so that’s one project nearly complete, and one to go! I LOVE the loon! It’s so Minnesota doncha know!! Wow, that sweater is very impressive! Oh wow! The Look sweater looks amazing! Really awesome knitting you got going on there. Aw, the baby totally makes that sweater! Wow – that sweater is amazing. I really like your socks, too. Oh, loon! I kept insisting on reading it “loom”. Silly me. Very nice! And what are you doing online? You’ve got an event to finish! There’s a reason that Canadians get along so well with Minnesotians!